But I wanted a very different options package. First, a car has to have cruise control. Knowing that we do a lot of highway driving, we think it's the best option going. In fact, it shouldn't even be an option. Simple as that. But I also wanted a standard transmission, and I did not want the added cost of air conditioning. Besides which, we were buying this size of vehicle specifically for the fuel economy and having air conditioning on a little car like this just doesn't make sense, especially when most of it's use would be in Canada where you might only use it about two weeks of the year. Probably a slight exaggeration, but you get my point. 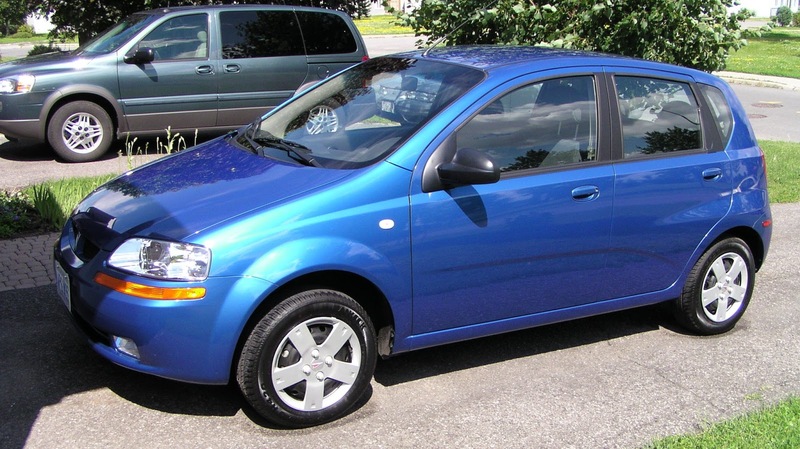 The day we bought the little blue car at the end of June 2006. Anyway, you couldn't order cruise control without also ordering power windows and power door locks. It was part of an option package, and I'm glad it came that way. Power windows and locks (and remote key fob) are definitely convenient. So the other day, we were driving into Swift Current to do grocery shopping when it clicked over to 200,000 kms. This day would have been meaningless if the little blue car were American because it would have been 124,274 miles. So it's also funny how we totally ignored the day that it clicked past 160,934 kms which would have been 100,000 miles! Eight years and 200,000 kilometers (124,274 miles) later and the little blue car still has the original brake pads and shoes and the original clutch. Lots of highway miles! One of my jobs today is to oil spray rustproof the car. I bought a couple of spray cans of Krown oil spray which is the very best vehicle anti-rustproofing product out there. $8 per can, and a couple of hours work. I've done this every year, and despite the fact that the little blue car was driven for a couple of Ontario winters where they deliberately and excessively use salt on the roads, there is zero rust on this vehicle. Looking at the car the other day, I don't see why it can't go another 200,000 kms! Taken the other day. The little blue car loves going out to explore! An interesting side note. 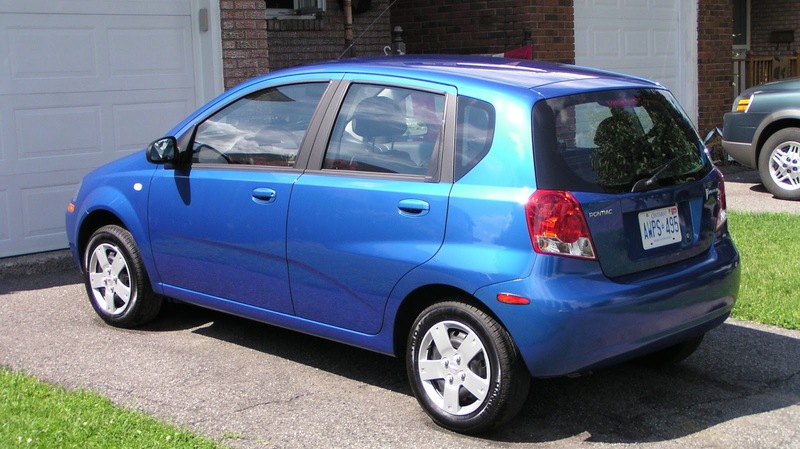 The little blue car is a Pontiac Wave. Built by GM Daewoo, a General Motors subsidiary in South Korea. The little blue car was actually built in Bupyeong, South Korea...just outside of Seoul. We have a 2000 Pontiac Grand Am and we just turned over 200,000 American miles yesterday. Love those Pontiacs. So sad they are gone! Yep, I have owned several Pontiac's years ago. The Grand Am was a popular car. It was really peppy with the V6 engine! It sure pays to maintain your vehicles. Our 2006 Saturn has 185,00 kms on the odometer plus towed about another 120,000 kms , totalling about 300,000 kms. Replaced the brakes 2 years ago and tires about every three years. Had it oil sprayed 3 times but it has never been driven in a Canadian winter so looks and runs like new. Keeping mind that your Saturn also has plastic outer body panels that don't rust. And given that it's never been driven in a Canadian winter, it would only need to be oil sprayed once every three years or so. I was hoping you would talk about the oil spray as here in Pa and Ohio I never hear of doing this and cars literally rust apart in 10-12 years. I didn't know it was a product in a spray can I supposed it was just oil in a garden sprayer. If you would have time to tell a few more details it would be appreciated..
Garry, I will do a detailed post tomorrow regarding how to properly rustproof your car! It is very serendipitous that not too long ago at all, you were thinking of selling the LBC or giving it to Alex, but somehow, you resisted both temptations. Now it will remain a perfectly fitting piece to your Puzzle of Life, for years to come! You're right, it wasn't that long ago that we were thinking of selling the little blue car or giving (selling? lending?) it to our son. We decided that because the most we would get for it is maybe $3,500 that we were simply better off keeping it because it's worth more than that to us. Yes, it does and we are hoping that we can keep it looking that way for a few years yet. Congrats to the little blue car and it's careful owners. We had a Honda Accord that reached 325K until David ignored it's warning about a failing water pump. I had a hard time forgiving him for that. I knew it would make 500K. Looking forward to your rush proof blog. It also helps that the car isn't driven in the winter any more and the fact it won't be getting lots of miles put on it in the next few years. Shame about your car, it sounds like it was doing really well! You are totally right Paul and Marti! Regular maintenance goes a long way to keeping cars in good condition.